I was lucky enough to do a Dragon Workshop with Birdy Heywood through the British Polymer Clay Guild, and she got me hooked on creating dragons in Polymer Clay. Immediately I could see how I could put my own twist on these creatures, by covering them with individual caned scales, giving them teeth, extruded claws, and other intricate details. I also use Sculpey Premo Clay for these little beats. 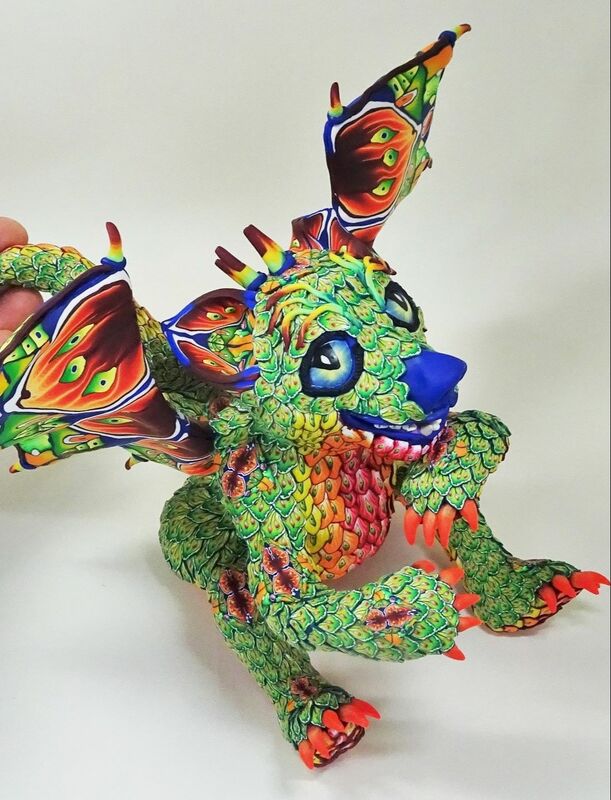 I have loved making dragons, and have developed my own techniques, from the inside out, to create these creatures. Between 6 - 8 inches tall, they are just the right size for a table or shelf decoration, and will watch you with their big caned eyes. After the dragons came the flowers. This was as a direct result of the 'Into The Forest' collaboration in which I participated. I had great fun creating flowers for the forest, taught myself some new techniques, and switched to Kato Polyclay for these. I put a lot of details in these flowers, the middles often have multiple layers of clay, with apertures looking from one layer to the next. The anthers are all added by hand, and I will add up to 300 of these, all individually hand wired in place, per sculpture. These flowers helped me push my engineering with clay skills to a new level. From the flowers I moved onto bigger, more complex structures such as my Flying Lizard entry for the 2017 International Polymer Clay Awards. Again, I learnt so many new skills as I tried to balance the lizard from that single foot, as he steps into the unknown. The skills learnt here, now enable me to try even more adventurous works. in the work that is only seen close up. Both the top and the underneath of the hang glider are made from multiple canes, green leaves on the top, colourful petals underneath. 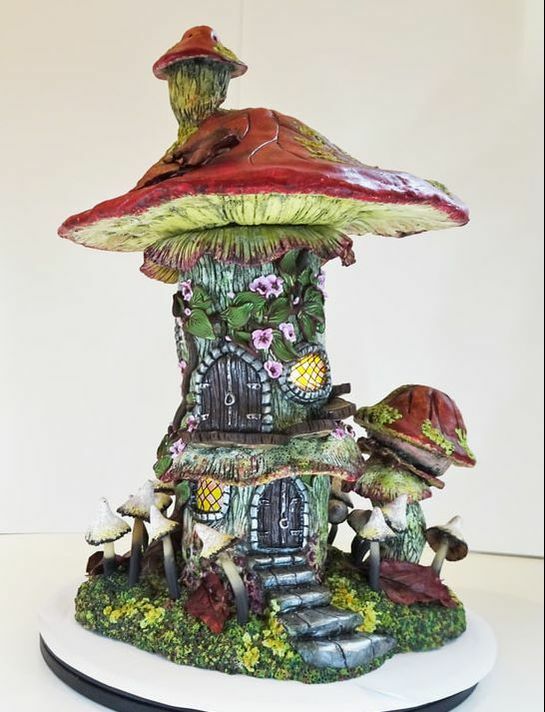 In 2018, as part of a session run for our local Polymer Clay Group, I needed to make a sample Fairy House. Based initially round glass jars, I had so much fun making mine. I now make them with several levels, with added caned elements, around painted facades and built from scrap Polymer Clay. I have a feeling these will be a part of my onward polymer sculpture journey. I love the fact that the houses can be lit from within, and also are secret storage places, making them usable sculptures. Here are some of my sculptural creations.